Thanks for coming back to my blog! 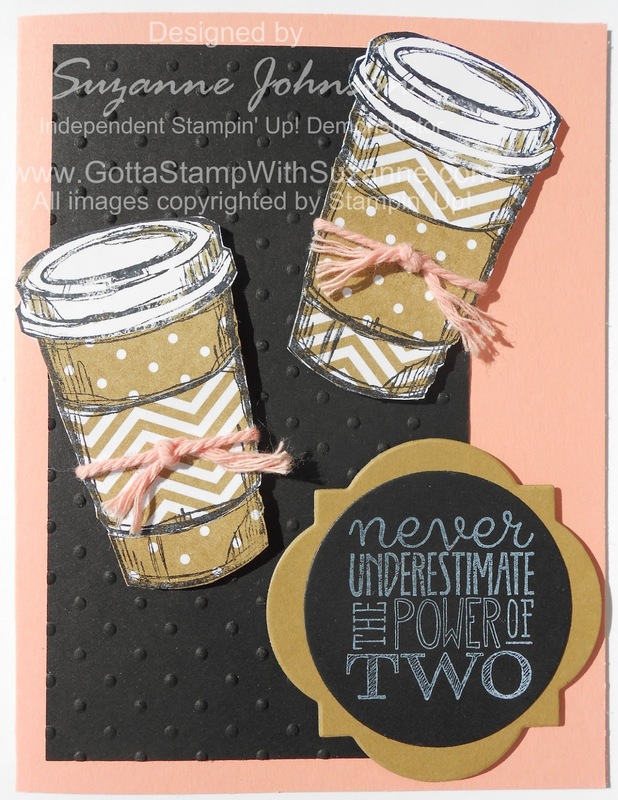 Here is another sample using the "Perfect Blend" stamp set and designer paper. This sample pairs Baked Brown Sugar and Crisp Cantaloupe, however, you could pair any two In Colors and this design would look awesome! I tied a piece of the new thick twine in coordinating Crisp Cantaloupe around the cups. For a more feminine look, you could tie a bow, use ribbon, or add a Simply Pressed Clay flower! The Basic Black background panel was textured with Perfect Polka Dots Embossing Folder (and the Big Shot). The Baked Brown Sugar panel behind the sentiment was cut with one of the Window Frames Framelits; the sentiment was stamped with White Craft Ink on black and cut with a Circle Framelit. The cups and sentiment were attached with Stampin' Dimensionals.